Get an expedited quote and select specified user requirements for both gas cabinets and VMBs using our Dominus™ system configurator. Our combined engineering and manufacturing know-how sets us apart from traditional design or contract manufacturing firms. We extend this experience into demanding markets around the globe including microelectronics, life science, commercial, aerospace, medical and industrial. Introducing our new Dominus™ line of delivery systems! Our new gas cabinet (GC) and valve manifold box (VMB) systems offer a wide range of configurations to match your needs and come wih a proven record for semiconductor applications. 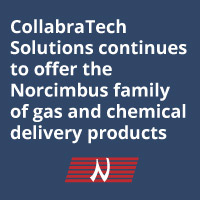 CollabraTech Solutions is a full-service integration company providing engineering, automation, manufacturing, and project management services.